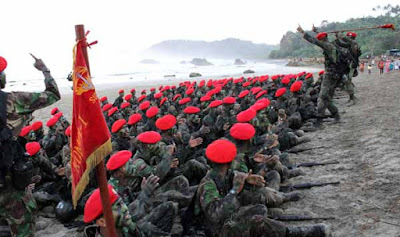 Group 3 / Sandhi Yudha is the Special Force or Kopassus unit has a job specifications secret war '' Clandestine Operations '', including the ability to combat or combat intelligence, and counter insurgency (counter-insurgency). Group 3 was formed on July 24, 1967, is headquartered in Cijantung Command Headquarters, East Jakarta. Candidates selected personnel in this group is very tight at the start of the internal recruits are still training to personnel who have been on active duty in unity but has the talent intelligence which will then be trained again. Dhuaja used is "Chess Kottaman Wira Naraca byuha". The Basic training together with other Kopassus soldier namely Classes Para (2.5 months), Command School (7 months) plus other courses such as PH (Forest War), the PJD (Close Up War), Spursus (special combat School), Dakibu (Climber assault) but after that the candidates are educated intel combat more specifically: education Sandhi Yudha in Pusdik Passus, Batujajar, Bandung which is intelligence and education material support for intelligence knowledge in fields such as undercover operations, navigation, special self-defense, the use of tools- special tools and other intelligence. Even some of the personnel selected from this group was sent again to the school to the Education Center of Military Intelligence in foreign countries like the United States, Germany, Britain and even Israel. Among all types of Kopassus soldiers in the most specific education is a soldier in Group 3 / Sandhi Yudha. In military operations, prior to movement of large forces then conducted combat intelligence operations (combat intell), to determine the condition and situation in the field, this function is carried out by personnel with the ability Sandhi Yudha. In the ranks of the Special Forces Group 3 is a unit that has the qualifications combat intelligence. Sandhi Yudha unit is also often in the BKO-kan-kodam to the military command or other units. During the DOM in Aceh, soldiers from this group much in the BKO-kan under the command of Civil and Military Emergency Authority there, where they are members of the SGI (Joint Intelligence Unit). In a clandestine operation tasks (clandestine), soldier Sandhi Yudha unit can move without a clear identity, or undercover work, for example in this case they will be equipped with civic identity such as ID cards and sometimes have yellow cards jobseekers from the Department of Labor. Because of its ability in this clandestine operation, then in the period before the reform era, Sandhi Yudha unit is widely misused just for the sake of sheer power, so often cause negative effects. Including cases of murder of Theys Eluay), abductions of activists at the beginning of the reform also acted by sandhi yudha soldiers who are members of Rose Team. 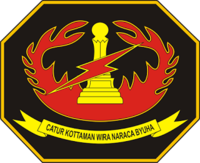 NIA (National Intelligence Agency), is one of many institutions that utilize personnel who have a background Sandhi Yudha. In operation BIN, in conditions that are needed, then they often use active personnel of the Group 3 / Sandhi Yudha. But there are some of those who fared very ironic that disappeared without a trace in field duties or even accidentally removing themselves and and rumored to join the paramilitary organizations in the outposts of the country. The lack of well-being becomes the main reason for this Deserters to leave his job, while the organizations para-military mission and business-oriented separatism offers benefits in terms of economics for them. They also often a black market actors in the theater of operations to help the group that should be the target operations. 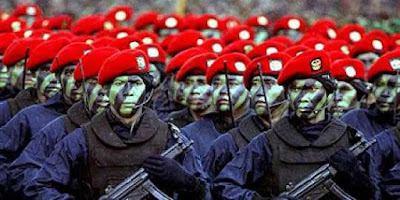 But regardless of all the cases and issues that hit Kopassus tilted as warriors home Sandhi Yudha, they have a very significant contribution, especially in terms of intelligence in this country. Many of the alumni information Sandhi Yudha and active in Group 3 against the state concerning distractions separatism, terrorism in the country and the participation of other nations in disrupting the integrity of the Republic. 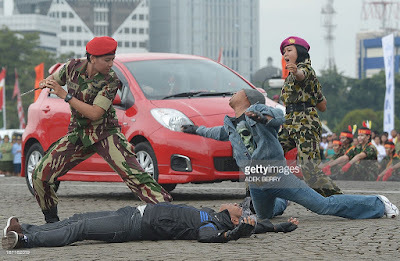 They played behind the scenes without appearing to face the risk of very heavy duty and away from his family even less than the soldier's Sandhi Yudha unknown own child so return duty for eternity in a theater of operations. better return than the name failed on the battlefield.